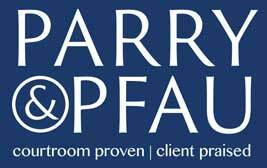 Zach Parry is a highly regarded civil litigator who has been recognized both locally and nationally for his results. He primarily represents people who are injured by the careless acts of others. He works hard to make our communities safer by holding people accountable for their choices. Matt Pfau represents people who have litigation and estate planning needs. He is an award-winning attorney who helps his clients receive their rightful inheritance and money for others' failure to uphold their legal duties. He is also expert in all aspects of estate planning and probate.